Chile, officially the Republic of Chile, is a country in South America occupying a long and narrow coastal strip wedged between the Andes Mountains and the Pacific Ocean. It encompasses a remarkable variety of landscapes, including the driest desert (the Atacama) in the world, the highest mountain range (the Andes) in the hemisphere, and temperate rainforests. The north contains great mineral wealth, while the south is rich in forests and grazing lands and features a string of volcanoes and lakes. Its vast areas of extreme beauty support a growing tourist industry. Except for a military junta that held power from September 1973 to March 1990, the country has been relatively free of the coups common to many of its neighbors and has a long history of democracy. Since its return to democracy in 1990, Chile has been an active participant in the international political arena; it is an active member of the United Nations family of agencies and participates in UN peacekeeping activities. It has been an important actor on international economic issues and hemispheric free trade. In the mid-1970s, Chile pioneered the adoption of market-oriented structural reforms. For almost two decades Chile had the best performing economy in the region and its economic and financial policy reforms served as an example for other Latin American nations. In 1999, Chile experienced negative economic growth for the first time in more than 15 years. Despite the effects of the recession, Chile maintained its reputation for strong financial institutions and sound policy. From 2000-06, growth ranged between 2 and 6 percent. Throughout these years Chile maintained a low rate of inflation with GDP growth coming from high copper prices, solid export earnings (particularly forestry, fishing, and mining), and growing domestic consumption. Today Chile has a market-oriented economy characterized by a high level of foreign trade. Currently, Chile is one of South America's most stable and prosperous nations. Within the greater Latin American context, it leads in terms of competitiveness, quality of life, political stability, globalization, economic freedom, low perception of corruption, and comparatively low poverty rates. It also ranks high regionally in freedom of the press, human development and democratic development. Its status as the region's richest country in terms of gross domestic product (GDP) per capita is, however, countered by its high level of income inequality. A long and narrow coastal Southern Cone country on the west side of the Andes Mountains, Chile stretches over 2,880 miles (4,630 km) north to south, but averages only 110 miles at its widest point east to west. This encompasses a remarkable variety of landscapes, including the driest desert in the world, the highest mountain range in the hemisphere, and temperate rainforests. The Pacific Ocean forms the country's entire western border, with Peru to the north, Bolivia to the northeast, Argentina to the east, and the Drake Passage at the country's southernmost tip. At 292,240 square miles (756,950 sq. 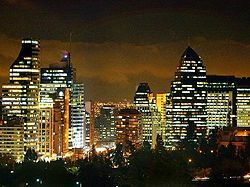 km), Chile is the world's 38th largest country, comparable in size to Zambia and about twice the size of Japan. 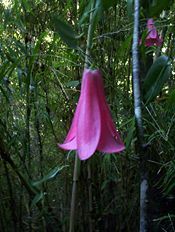 A red copihue (Chilean bellflower), the national flower, which grows in the woods of southern Chile. The northern Atacama Desert contains great mineral wealth, primarily copper and nitrates. The relatively small Central Valley, which includes Santiago, dominates the country in terms of population and agricultural resources. This area also is the historical center from which Chile expanded in the late nineteenth century, offering incentives to colonists of the northern and southern regions, areas with more extreme climates. Chile is geologically active. It has more than thirty active volcanoes, and about 12 or more major earthquakes hit the country every century. Temblors are even more frequent. A 7.7 magnitude quake struck in northern Chile on November 14, 2007, killing at least two people and leaving 15,000 homeless. On February 27, 2010, Chile was struck by an 8.8 magnitude earthquake, one of the largest ever recorded in the world. As many as 500 people died; hundreds of thousands of buildings were damaged. The earthquake was also followed by multiple aftershocks. Southern Chile is rich in forests and grazing lands and features a string of volcanoes and lakes. The southern coast is a labyrinth of fjords, inlets, canals, twisting peninsulas, and islands. The Andes Mountains are the eastern border. Chile also claims 482,628 square miles (1,250,000 sq km) of Antarctica as part of its territory. However, this claim is suspended under the terms of the Antarctic Treaty, of which Chile is a signatory nation. Chile controls Easter Island and Sala y Gómez Island, the easternmost islands of Polynesia, which it incorporated into its territory in 1888, and Robinson Crusoe Island, more than 375 miles (600 km) from the mainland, in the Juan Fernández archipelago. Easter Island is now a province of Chile. Also controlled but only temporally inhabited (by local fishermen) are the small islands of Sala y Gómez, San Ambrosio, and San Felix, notable because they extend Chile's claim to territorial waters out from its coast into the Pacific. The Humboldt current flows along Chile's coast, cooling the water and bringing with it abundant marine animals, including anchovies, sea bass, and other commercial fish. Mapuche were original inhabitants of central and southern Chile. There are various theories about the origin of the word Chile. According to one theory the Incas of Peru, who had failed to conquer the Araucanians, called the valley of the Aconcagua "Chili" by corruption of the name of a tribal chief ("cacique") called Tili, who ruled the area at the time of the Incan conquest. Another theory points to the similarity of the valley of the Aconcagua with that of the Casma Valley in Peru, where there were a town and valley named Chili. Other theories say Chile may derive its name from the indigenous Mapuche word chilli, which may mean "where the land ends," "the deepest point of the earth," or "sea gulls;" or from the Quechua chin, "cold," or the Aymara tchili, meaning "snow." Another meaning attributed to chilli is the onomatopoeic cheele-cheele—the Mapuche imitation of a bird call. The Spanish conquistadors who heard about this name from the Incas and the few survivors of Diego de Almagro's first Spanish expedition south from Peru in 1535-1536 called themselves the "men of Chilli." The first humans arrived in Chile about 13,000 to 10,000 years ago, settling in fertile valleys and along the coast. One group, called the Chinchorros is known for early mummification. By 500 C.E., significant human populations had been established throughout the region. In 1470, the Incas briefly extended their empire into what is now northern Chile, imposing a labor tribute that included gold mining, but the area's barrenness prevented extensive settlement. In 1520, while attempting to circumnavigate the earth, the Portuguese explorer Ferdinand Magellan discovered the southern passage now named after him, the Strait of Magellan. The next Europeans to reach Chile were Diego de Almagro and his band of Spanish conquistadors, who came from Peru in 1535 seeking gold. The Spanish encountered hundreds of thousands of Native peoples from various cultures in the area that modern Chile now occupies. These cultures supported themselves principally through slash-and-burn agriculture and hunting. 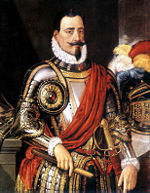 The conquest of Chile began in earnest in 1540, and was carried out by Pedro de Valdivia, one of Francisco Pizarro's lieutenants, who founded the city of Santiago. Although the Spanish did not find the extensive gold and silver they sought, they recognized the agricultural potential of Chile's central valley, and Chile became part of the Viceroyalty of Peru. Conquest of the land that is today called Chile took place only gradually, and the Europeans suffered repeated setbacks at the hands of the local population. A massive Mapuche insurrection that began in 1553 resulted in Valdivia's death and the destruction of many of the colony's principal settlements. Subsequent major insurrections took place in 1598 and in 1655. Each time the Mapuche and other native groups revolted, the southern border of the colony was driven northward. The abolition of slavery in 1683 defused tensions on the frontier between the colony and the Mapuche land to the south, and permitted increased trade between colonists and the Mapuche. The drive for independence from Spain was precipitated by usurpation of the Spanish throne by Napoleon Bonaparte's brother, Joseph, in 1808. A national junta in the name of Ferdinand—heir to the deposed king—was formed in 1810 and proclaimed Chile an autonomous republic within the Spanish monarchy. A movement for total independence soon won a wide following. Spanish attempts to re-impose arbitrary rule during what was called the "Reconquista" led to a prolonged struggle. Though not the first outsiders to visit Easter Island, two Chilean ships stopped there in 1837. At that time, Chile claimed the largest naval fleet in the Pacific Ocean. In 1888, a Chilean captain took formal possession of the island in the name of the Republic of Chile. Twelve Rapanui chiefs ceded sovereignty to Chile "forever." 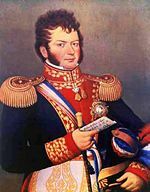 Intermittent warfare continued until 1817, when an army led by Bernardo O'Higgins, Chile's most renowned patriot, and José de San Martín, hero of the Argentine war of independence, crossed the Andes into Chile and defeated the royalists. On February 12, 1818, Chile was proclaimed an independent republic. The political revolt brought little social change, however, and 19th century Chilean society preserved the essence of the stratified colonial social structure, which was greatly influenced by family politics and the Roman Catholic Church. A strong presidency eventually emerged, but wealthy landowners remained extremely powerful. Toward the end of the nineteenth century, the government in Santiago consolidated its position in the south by ruthlessly suppressing the Mapuche during the occupation of Araucanía. In 1881, it signed a treaty with Argentina confirming Chilean sovereignty over the Strait of Magellan. As a result of the War of the Pacific with Peru and Bolivia (1879–1883), Chile expanded its territory northward by almost one-third, eliminating Bolivia's access to the Pacific, and acquired valuable nitrate deposits, the exploitation of which led to an era of national affluence. The Chilean civil war, in 1891, brought about a redistribution of power between the president and Congress, and Chile established a parliamentary-style democracy. However, the civil war had also been a contest between those who favored the development of local industries and powerful Chilean banking interests, particularly the House of Edwards, which had strong ties to foreign investors. Hence the Chilean economy partially degenerated into a system protecting the interests of a ruling oligarchy. By the 1920s, the emerging middle and working classes were powerful enough to elect a reformist president, Arturo Alessandri Palma, whose program was frustrated by a conservative Congress. Alessandri Palma's reformist tendencies were partly tempered later by an admiration for some elements of Mussolini's Italian Corporate State. In the 1920s, Marxist groups with strong popular support arose. A military coup led by General Luis Altamirano in 1924 set off a period of political instability that lasted until 1932. When constitutional rule was restored in 1932, a strong middle-class party, the Radicals, emerged and became the key force in coalition governments for the next twenty years. During the period of Radical Party dominance, the state increased its role in the economy. In 1952, voters returned conservatives to power democratically. The 1964 presidential election of Christian Democrat Eduardo Frei Montalva initiated a period of major reform. His administration embarked on far-reaching social and economic programs, particularly in education, housing, and agrarian reform, including unionization of agricultural workers. By 1967, however, Frei encountered increasing opposition from leftists, who charged that his reforms were inadequate, and from conservatives, who found them excessive. At the end of his term, Frei had accomplished many noteworthy objectives, but he had not fully achieved his party's ambitious goals. In 1970, Senator Salvador Allende, a Marxist physician and member of Chile's Socialist Party, who headed a coalition of the Socialist, Communist, Radical, and Social-Democratic parties, won a plurality of votes in a three-way contest. Congress chose Allende in a runoff vote. Allende's program included advancement of workers' interests; a thorough implementation of agrarian reform; the reorganization of the national economy into socialized, mixed, and private sectors; a foreign policy of "international solidarity" and national independence; and a new institutional order (the "people's state"), including a unicameral congress. The platform also called for nationalization of foreign ownership of Chile's major copper mines. An economic depression that began in 1967 peaked in 1970, exacerbated by capital flight, plummeting private investment, and withdrawal of bank deposits by those opposed to Allende's socialist program. Production fell and unemployment rose. Allende adopted measures including price freezes, wage increases, and tax reforms, which had the effect of increasing consumer spending and redistributing income downward. Joint public-private public works projects helped reduce unemployment. Much of the banking sector was nationalized. Many enterprises within the copper, coal, iron, nitrate, and steel industries were expropriated, nationalized, or subjected to state intervention. Industrial output increased sharply and unemployment fell during the Allende administration's first year. Other reforms undertaken during the early Allende period included redistribution of millions of hectares of land to landless agricultural workers as part of the agrarian reform program, giving the armed forces an overdue pay increase, and providing free milk to children. The Indian Peoples Development Corporation and the Mapuche Vocational Institute were founded to address the needs of Chile's indigenous population. The nationalization of U.S. and other foreign-owned companies led to increased tensions with the United States. The Nixon administration brought international financial pressure to bear to restrict economic credit to Chile. Simultaneously, the CIA funded opposition media, politicians, and organizations, helping to accelerate a campaign of domestic destabilization. By 1972, the economic progress of Allende's first year had been reversed and the economy was in crisis. Political polarization increased, and large mobilizations of both pro- and anti-government groups became frequent, often leading to clashes. By early 1973, inflation was out of control. The crippled economy was further battered by prolonged and sometimes simultaneous strikes by physicians, teachers, students, truck owners, copper workers, and the small business class. A military coup overthrew Allende on September 11, 1973. As the armed forces bombarded the presidential palace, Allende reportedly committed suicide. A military government, led by General Augusto Pinochet Ugarte, took over. The first years of the regime were marked by serious human rights violations. At least a thousand people were executed during Pinochet's first six months in office, and at least two thousand more were killed during the next 16 years. Some 30,000 fled the country, and tens of thousands of people were detained and tortured, as investigated by the 2004 Valech Commission. A new constitution was approved by a highly irregular and undemocratic plebiscite, and General Pinochet became president for an eight-year term. In the late 1980s, the regime gradually permitted greater freedom of assembly, speech, and association, to include trade union and limited political activity. During Pinochet's nearly 17 years in power, Chile moved away from state involvement toward a largely free-market economy that saw increased domestic and foreign private investment, although the copper industry and other important mineral resources were not returned to foreign ownership. In a 1988 plebiscite, Pinochet was denied a second term as president. Chileans elected a new president, Christian Democrat Patricio Aylwin, the candidate of a coalition of 17 political parties, who served from 1990 to 1994, in what was considered a transition period. In December 1993, Christian Democrat Eduardo Frei Ruiz-Tagle, the son of previous president Eduardo Frei Montalva, led the coalition to victory. He was succeeded in 2000, by Socialist Ricardo Lagos. 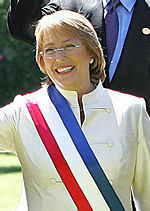 In January 2006, Chileans elected their first woman president, Michelle Bachelet Jeria, of the Socialist Party. She was sworn in on March 11, 2006, extending coalition governance for another four years. Chile's constitution was approved in a highly irregular national plebiscite in September 1980, under the military government of Augusto Pinochet. It entered into force in March 1981. After Pinochet's defeat in the 1988 plebiscite, the constitution was amended to ease provisions for future amendments. In September 2005, President Ricardo Lagos signed into law several constitutional amendments that eliminated the positions of appointed senators and senators for life, granted the president authority to remove the commanders-in-chief of the armed forces, and reduced the presidential term from six to four years. The president is constitutionally barred from serving consecutive terms. 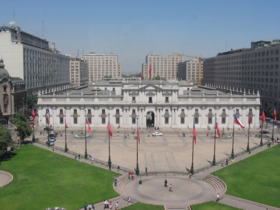 Chile's bicameral Congress has a 38-seat Senate and a 120-member Chamber of Deputies. Senators serve for eight years with staggered terms, while deputies are elected every four years. 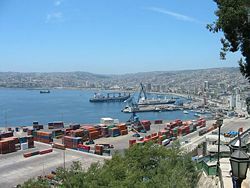 The Congress is located in the port city of Valparaíso, about 84 miles (140 km) west of the capital, Santiago. Chile's congressional elections are governed by a binomial system that rewards large representations. Therefore, there are only two Senate and two Deputy seats apportioned to each electoral district; parties are forced to form wide coalitions and, historically, the two largest coalitions (Concertación and Alianza) split most of the seats in a district. Only if the leading coalition ticket outpolls the second-place coalition by a margin of more than 2-to-1 does the winning coalition gain both seats. In 2005, both leading parties lost representation in favor of their respective allies, the Socialist Party (which became the biggest party in the Concertación bloc) and National Renewal in the right-wing alliance. The Communist Party again failed to gain any seats in the election. Chile's judiciary is independent and includes a court of appeal, a system of military courts, a constitutional tribunal, and the Supreme Court. In June 2005, Chile completed a nationwide overhaul of its criminal justice system. The reform replaced inquisitorial proceedings with an adversarial system more similar to that of the United States. Chile is divided into fifteen regions, each of which is headed by an intendant appointed by the president. Every region is further divided into provinces, with a provincial governor also appointed by the president. Finally, each province is divided into communes, which are administered by municipalities, each with its own mayor and councilmen elected by their inhabitants for four years. Since its return to democracy in 1990, Chile has been an active participant in the international political arena. Chile completed a two-year non-permanent position on the UN Security Council in January 2005. José Miguel Insulza, a Chilean national, was elected Secretary General of the Organization of American States in May 2005. Chile is an active member of the UN family of agencies and participates in UN peacekeeping activities. Chile hosted the Community of Democracies ministerial in April 2005. An associate member of Mercosur and a full member of APEC, Chile has been an important actor on international economic issues and hemispheric free trade. The Chilean government has diplomatic relations with most countries. It settled its territorial disputes with Argentina during the 1990s. Chile and Bolivia severed diplomatic ties in 1978 over Bolivia's desire to reacquire territory it lost to Chile in the 1879-83 War of the Pacific. The two countries maintain consular relations and are represented at the Consul General level. Chile is, after Brazil, the country that invests the most in defense in South America. Chile's armed forces are subject to civilian control exercised by the president through the minister of defense. The president has the authority to remove the commanders-in-chief of the armed forces. The army is one of the most professional and technologically advanced in Latin America. With the return of democratic government, the national police were placed under the operational control of the Interior Ministry but remained under the nominal control of the Defense Ministry. The force of 30,000 men and women is responsible for law enforcement, traffic management, narcotics suppression, border control, and counter-terrorism throughout Chile. Airbus A340 of LAN Airlines, the largest in Latin America. Chile has pursued generally sound economic policies for nearly three decades. 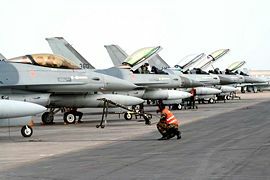 The 1973-90 military government sold many state-owned companies, and the three democratic governments since 1990 have continued privatization, though at a slower pace. The government's role in the economy is mostly limited to regulation, although the state continues to operate copper giant CODELCO and a few other enterprises (there is one state-run bank). Chile is strongly committed to free trade and has welcomed large amounts of foreign investment. It has signed free trade agreements (FTAs) with a whole network of countries, including the United States, the European Union, South Korea, New Zealand, Singapore, Brunei, the People's Republic of China, and Japan. It reached a partial trade agreement with India in 2005 and began negotiations for a full-fledged FTA with India in 2006. Chile plans to continue its focus on its trade ties with Asia by negotiating trade agreements with Thailand, Malaysia, and Australia. High domestic savings and investment rates helped propel Chile's economy to average growth rates of 8 percent during the 1990s. The privatized national pension system (AFP) has encouraged domestic investment and contributed to an estimated total domestic savings rate of approximately 21 percent of GDP. However, the AFP is not without its critics, who cite low participation rates (only 55 percent of the working population is covered), with groups such as the self-employed outside the system. There has also been criticism of its inefficiency and high costs due to a lack of competition among pension funds. Critics cite loopholes in the use of pension savings through lump sum withdrawals for the purchase of a second home or payment of university fees as fundamental weaknesses of the AFP. The Bachelet administration plans substantial reform, but not an overhaul, of the AFP during the next several years. Unemployment stubbornly hovered in the 8-10 percent range after the start of the economic slowdown in 1999, well above the 5-6 percent average for the 1990s. Unemployment kept falling in 2007, dropping below 7 percent since April 2007 (based on the [Central Bank of Chile's seasonally adjusted data up to mid-year). Wages have risen faster than inflation as a result of higher productivity, boosting national living standards. The percentage of Chileans with incomes below the poverty line—defined as twice the cost of satisfying a person's minimal nutritional needs—fell from 46 percent in 1987 to around 13.7 percent in 2006 according to a study done in June 2007. Critics in Chile, however, argue true poverty figures are considerably higher than those officially published. Using the relative yardstick favored in many European countries, 27 percent of Chileans would be poor, according to Juan Carlos Feres of the UN Economic Commission for Latin America and the Caribbean. Despite enjoying a comparatively higher GDP and more robust economy compared to most other countries of Latin America, Chile suffers from one of the most uneven distributions of wealth in the world, ahead only of Brazil in the Latin American region and lagging behind even that of most developing sub-Saharan African nations. Chile's top 10 richest percentile possesses 47 percent of the country's wealth. In relation to income distribution, some 6.2 percent of the country populates the upper economic income bracket, 15 percent the middle bracket, 21 percent the lower middle, 38 percent the lower bracket, and 20 percent the extreme poor. Chile's independent Central Bank pursues an inflation target of between 2 and 4 percent. Inflation has not exceeded 5 percent since 1998. The Chilean peso’s rapid appreciation against the U.S. dollar in recent years has helped dampen inflation. Most wage settlements and loans are indexed, reducing inflation's volatility. Under the compulsory private pension system, most formal sector employees pay 10 percent of their salaries into privately managed funds. 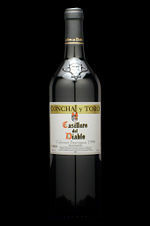 Chile is the world's fifth exporter of wine. After a decade of impressive growth rates, Chile began to experience a moderate economic downturn in 1999, brought on by unfavorable global economic conditions related to the Asian financial crisis, which began in 1997. The economy remained sluggish until 2003, when it began to show clear signs of recovery. Real GDP growth reached 5.7 percent in 2005 before falling back to 4.0 percent growth in 2006. Higher energy prices as well as lagging consumer demand were drags on the economy. Higher government spending and favorable external conditions (including record copper prices for much of 2006) were not enough to offset these drags. For the first time in many years, Chilean economic growth in 2006 was among the weakest in Latin America. GDP was expected to expand by 6 percent in 2007. Total foreign direct investment (FDI) was only $3.4 billion in 2006, up 52 percent from a poor performance in 2005. However, 80 percent of FDI continues to go to only four sectors: electricity, gas, water, and mining. Much of the jump in FDI in 2006 was also the result of acquisitions and mergers and has done little to create new employment. The Chilean government has formed a Council on Innovation and Competition, which is tasked with identifying new sectors and industries to promote. It is hoped that this, combined with some tax reforms to encourage domestic and foreign investment in research and development, will bring in additional FDI and to new parts of the economy. As of 2006, Chile invested only 0.6 percent of its annual GDP in research and development (R&D). Even then, two-thirds of that was government spending. That domestic and foreign companies spend almost nothing on R&D does not bode well for the government’s efforts to develop innovative, knowledge-based sectors. Beyond its general economic and political stability, the government also has encouraged the use of Chile as an "investment platform" for multinational corporations planning to operate in the region, but this will have limited value given the developing business climate in Chile itself. Chile's approach to foreign direct investment is codified in the country's Foreign Investment Law, which gives foreign investors the same treatment as Chileans. Registration is simple and transparent, and foreign investors are guaranteed access to the official foreign exchange market to repatriate their profits and capital. A record year for Chilean trade was experienced in 2006. Total trade registered a 31 percent increase over 2005. During 2006, exports of goods and services totaled U.S. $58 billion, an increase of 41 percent. This figure was somewhat distorted by the skyrocketing price of copper. In 2006, copper exports reached a historical high of U.S. $33.3 billion. Imports totaled U.S. $35 billion, an increase of 17 percent compared to the previous year. 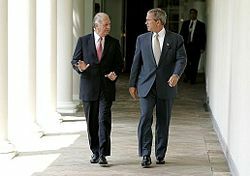 Chile thus recorded a positive trade balance of U.S. $23 billion in 2006. The main destinations for Chilean exports were the Americas (U.S. $39 billion), Asia (U.S. $27.8 billion), and Europe (U.S. $22.2 billion). Seen as shares of Chile’s export markets, 42 percent of exports went to the Americas, 30 percent to Asia, and 24 percent to Europe. Within Chile’s diversified network of trade relationships, its most important partner remained the United States. Total trade with the U.S. was U.S. $14.8 billion in 2006. Since the U.S.-Chile Free Trade Agreement went into effect on January 1, 2004, U.S.-Chilean trade has increased by 154 percent. Internal government figures show that even when factoring out inflation and the recent high price of copper, bilateral trade between the U.S. and Chile has grown over 60 percent since then. Total trade with Europe also grew in 2006, expanding by 42 percent. The Netherlands and Italy were Chile’s main European trading partners. Total trade with Asia also grew significantly at nearly 31 percent. Trade with Korea and Japan grew significantly, but China remained Chile’s most important trading partner in Asia. Chile’s total trade with China reached U.S. $8.8 billion in 2006, representing nearly 66 percent of the value of its trade relationship with Asia. 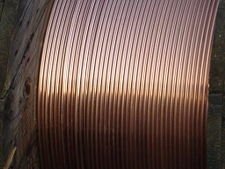 Chile’s overall trade profile has traditionally been dependent upon copper exports. The state-owned firm CODELCO is the world's largest copper-producing company, with recorded copper reserves of 200 years. Chile has made efforts to expand nontraditional exports. The most important non-mineral exports are forestry and wood products, fresh fruit and processed food, fishmeal and seafood, and wine. Chile's growth has been declining since the early 1990s, due to a decreasing birthrate. By 2050, the population is expected to reach approximately 20.2 million. About 85 percent of the country's population lives in urban areas, with 40 percent living in Greater Santiago. Population of Chile from 1835, projected to 2050. The bulk of the Chilean population are mestizos, descendants of colonial Spanish immigrants and Amerindian females. Chile's ethnic structure can be classified as 30 percent white, 5 percent Native American, and 65 percent predominantly white mestizos. 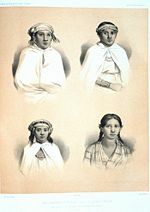 Whites are mostly Spanish in origin (mainly Castillians, Andalusians, and Basques), and to a much lesser degree from Chile's various waves of immigrants. The black population was always scant, reaching a high of 25,000 during the colonial period; its racial contribution is less than 1 percent. The current original Native population is relatively small, although their numbers are augmented when one takes into consideration those who are physically similar and those who are linguistically or socially thought to belong to them. For the 2002 census, only indigenous people that still practiced the culture or spoke a native language were surveyed: 4.6 percent of the population fit that description; of these, 87.3 percent declared themselves Mapuche. 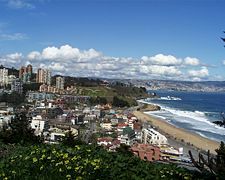 Panoramic view of Reñaca, Viña del Mar. Relative to its overall population, Chile never experienced any large-scale wave of immigrants. The total number of immigrants to Chile, both originating from other Latin American countries and all other (mostly European) countries, never surpassed 4 percent of its total population. This is not to say that immigrants were not important to the evolution of Chilean society and the Chilean nation. Basque families who migrated to Chile in the eighteenth century vitalized the economy and joined the old Castillian aristocracy to become the political elite that still dominates the country. Some non-Spanish European immigrants arrived in Chile - mainly to the northern and southern extremities of the country—during the nineteenth and twentieth centuries, including English, Germans, Irish, Italians, French, Croatians, and other former Yugoslavians. The prevalence of non-Hispanic European surnames among the governing body of modern Chile testifies to their disproportionate contribution. Also worth mentioning are the Korean and Palestinian communities, the latter being the largest colony of that people outside of the Arab world. The volume of immigrants from neighboring countries to Chile during those same periods was similar. During the last decade immigration to Chile has doubled, originating primarily from Argentina, Bolivia, and Peru, while emigration of Chileans has decreased. Gabriela Mistral, Nobel Prize for Literature (1945). Pablo Neruda, Nobel Prize for Literature (1971). Northern Chile was an important center of culture in the medieval and early modern Inca civilization, while the central and southern regions were areas of Mapuche cultural activity. Following their conquest and during the early Republican period, the culture was dominated by the Spanish. Other European influences, primarily English and French, began in the nineteenth century and continue to this day. The national dance is the cueca. Another form of traditional Chilean song, though not a dance, is the tonada. Arising from music imported by the Spanish colonists, it is distinguished from the cueca by an intermediate melodic section and a more prominent melody. In the mid-1960s native musical forms were revitalized by the Parra family with the Nueva Canción Chilena, which was associated with political activists and reformers, and by the folk singer and researcher on folklore and Chilean ethnography Margot Loyola. Chileans call their country país de poetas (land of poets). 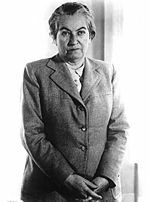 Gabriela Mistral was the first Chilean to win a Nobel Prize for Literature (1945). Chile's most famous poet, however, is Pablo Neruda, who also won the Nobel Prize for Literature (1971) and is world renowned for his extensive works on romance, nature, and politics. Tourism has become one of the main sources of revenue; in 2005, tourism grew by 13.6 percent, generating more than $1.5 billion (equivalent to 1.33 percent of the national GDP). San Pedro de Atacama, in the north, is very popular with foreign tourists who arrive to admire the Incaic architecture and the altiplano lakes of the Valley of the Moon. Putre, also in the north, has Chungará Lake, as well as the Parinacota and the Pomerape volcanoes, with altitudes of 6,348 m and 6,222 m, respectively. Throughout the central Andes there are many ski resorts of international repute. In the south, the main tourist sites are Chiloé island, Patagonia, the San Rafael Lagoon, with its many glaciers, and the Towers of Paine national park. 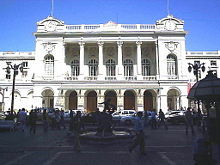 The central port city of Valparaíso, with its unique architecture, is also popular. Due to its proximity to Santiago, the coast of the Valparaíso Region, with its many beach resorts, receives the largest amount of local tourists. Easter Island in the Pacific Ocean is probably the main Chilean tourist destination. Viña del Mar, Valparaíso's northern affluent neighbor, is popular due to its beaches, casino, and its annual song festival, the most important musical event in Latin America. The official language is Spanish, though it is difficult for foreigners to understand due to the dropping of final syllables and "s" sounds, the very soft pronunciation of some consonants, and the high levels of slang employed, particularly in Santiago and the surrounding areas. Chileans also tend to speak much faster than natives of neighboring countries. Chile is a traditionally Roman Catholic nation, with a membership of an estimated 70 percent of the population. Other denominations or groupings include: Protestant or evangelical Christians (15.1 percent), Jehovah's Witnesses (1 percent), the Church of Jesus Christ of Latter-day Saints (0.9 percent), Jewish (0.1 percent), atheist or agnostic (8.3 percent), and other (4.4 percent). Less than 0.1 percent are either Orthodox or Muslim. ↑ 100 peso Coin. Banco Central de Chile. Retrieved January 6, 2012. ↑ Informe Latinobarómetro 2011, Latinobarómetro. Retrieved January 6, 2012. ↑ Instituto Nacional de Estadísticas (official estimate). Retrieved January 6, 2012. ↑ 4.0 4.1 4.2 4.3 Chile. International Monetary Fund. Retrieved January 6, 2012. ↑ Income Distribution - Inequality. OECD.StatExtracts. Retrieved January 12, 2012. Note: Data refer to Gini coefficient for income distribution "after taxes and transfers" using the "current definition" for the "total population". 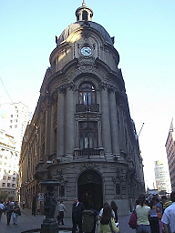 ↑ Central Bank of Chile, Empleo y desocupación desestacionalizados, nacional, Spanish language site. Retrieved November 15, 2007. ↑ The Economist Newspaper Limited, Destitute no more. Retrieved November 15, 2007. ↑ United Nations Development Programme, Beyond scarcity: Power, poverty and the global water crisis. Retrieved November 15, 2007. CIA World Factbook. Chile. Retrieved November 15, 2007. Encyclopædia Britannica. 2007. Chile. Encyclopædia Britannica Online. Retrieved November 15, 2007. Library of Congress Country Studies. A Country Study: Chile. Retrieved November 15, 2007. Rector, John. The History of Chile. Westport, CT: Greenwood Press, 2003. ISBN 0313317593. U.S. Department of State. Background Notes: Chile. Retrieved November 10, 2007. Torres del Paine, part of the Cordillera del Paine in Torres del Paine National Park. The town of San Juan Bautista, Robinson Crusoe Island. This page was last modified on 13 February 2017, at 17:11.